All of the insulators made at Victor from the summer of 1898 until the factory was destroyed by fire in January 1902 were marked with wordy incuse markings and all but the very small styles carried one or more of his patent dates. Larger insulators that bear one of the various the 4-date markings were usually also marked with the manufacturing date. After the fire, the 4-date markings and manufacturing date marking were not used again. Apparently the marking devices were destroyed in the fire. These were replaced with 6-date markings, #6-1 and #6-2, and later by the 7-date marking, #7-1 with the addition of the June 17, 1902 patent date. 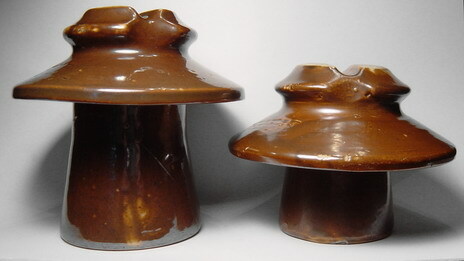 Most of the insulators made before 1904 have a tan or rich light brown glaze characteristic of using local glaze. 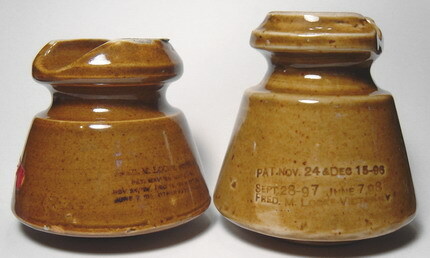 Specimens of some of the same styles made by EPMC with under-glaze ink markings have been found at the Victor dump, which may indicate the same under-glaze ink marking device used at EPMC was then being used at the Victor factory after the bankruptcy of EPMC in 1901. The crude "Locke Model" was struck over the glaze with the #6-3 marking ink stamp by Fred Locke a few years after it was made in early 1898. The famous "Locke Model", which was given to Jack Tod by the Victor plant manager in the early 1970's, has the #6-3 stamped on top of the glaze. This suggests that Fred Locke himself stamped the insulator and he probably had the marking device at Victor simply stamping the model that was made a few years earlier in early 1898. 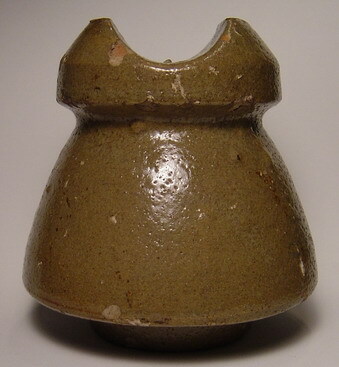 The “Locke Model” is an experimental glazed clay insulator made by Fred Locke probably in John Lapp, Sr.'s experimental kiln at Honeoye Falls, NY, just down the road from Victor. It was undoubtedly made as an experiment just before the Victor factory was built in the summer of 1898. Fred Locke's display at the 1904 St. Louis Worlds Fair. 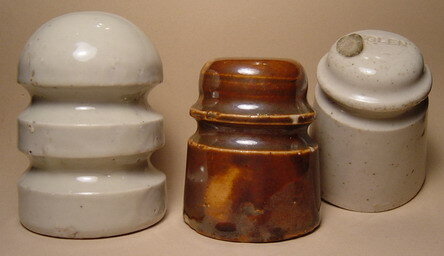 Some insulators were made with a white glaze, which was actually a clear glaze over the white porcelain body. This is similar to what EPMC and Imperial used on their twice-fired insulators. 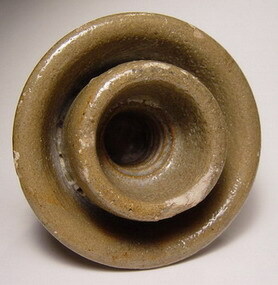 The clay insulator body was first fired at a high temperature to fuse the clay into porcelain. After cooling, the insulator was then dipped in glaze, dried, and fired again, but at a lower temperature. 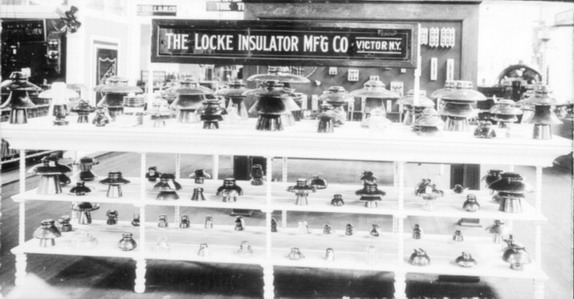 All of the insulators made at the Victor factory were single fired, which was a new development in the industry around 1898. U-55A, U-40, U-38 "GLEN" with marking detail, U-242, and U-380. Fred Locke insulators in the display that were made by glazewelding two or three shells together are: U-196, U-923F, U-927, U-927B, U-939C, U-939D, U-941A, U-955, U-957, and U-957A. 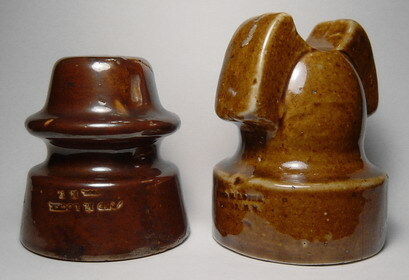 Many of the crowns of larger cable-top Fred Locke insulators were made separately and hand-applied in much the same manner as putting a handle on a teacup. Most notable style with this feature is M-2795, which also had the collar glazewelded underneath the top disk. U-957A and U-957. Both have the incuse 7-date marking #7-1. The specimen of U-957 is the only one know. It holds a special meaning to me. While researching in 1993 for my book about Fred Locke, Fred M. Locke: A Biography, I visited with two of Fred Locke's granddaughters in New York, Virginia Norton (age 85) and Inez Locke (age 83). In Inez's home was the little U-957 sitting upside-down on a table near the telephone. In in were several pencils. I asked to see the unusual pencil holder and recognized it right away as a new style made using Fred Locke's May 7, 1907 patent. 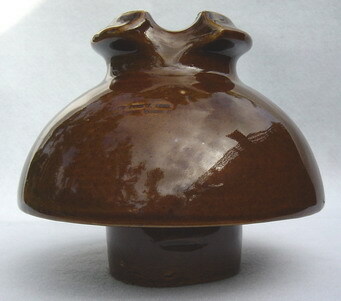 A 7-date incuse marking was struck on top, which was partially obscured by the thick, dark tan glaze. Several years later Inez passed away. Virginia was blind at this time. I received a package from her with a note inside saying that Inez had knocked off the insulator and broken it. Virginia picked up the pieces and put them in a plastic bag. Knowing my interest a few years earlier, she thought I might would like to have the insulator. Only the skirt was broken and the pieces glued together nicely. Fred Locke's 7-date incuse marking, #7-1.